A freshly squeezed glass of citrus juice is closer than you think. Imagine waking up in the morning to a glass of freshly squeezed orange juice from your very own orange tree, no matter where you live. Dwarf citrus trees can make this happy daydream a reality. Citrus trees don't require pollination to produce juicy fruit, making them the perfect container fruit tree. 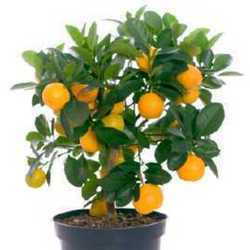 All you have to do is choose which dwarf citrus tree is the best for you. What Are Dwarf Citrus Trees? Grafting is an agricultural technique almost as old as agriculture itself. Fruit and vegetable growers use it for a variety of reasons, including, in the case of dwarf citrus trees, controlling the size of the plant. Growers first select a "dwarf rootstock" with limited growth potential. Then they graft shoots or buds onto the root stalk to create the top part of the tree, called the scion. This is the part that bears fruit. The limited growth potential of the rootstalk makes dwarf citrus trees ideal for container gardening as well as outdoor gardens with limited space. Some gardeners move their trees outside in the summer and keep them indoors in the wintertime, and others keep their fruit trees indoors year round. The choice is up to you. Most commercial dwarf citrus nurseries carry around 50 different varieties of dwarf citrus trees. 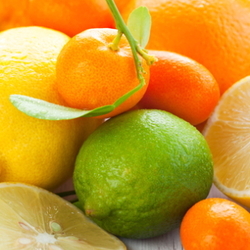 Lemons, limes, oranges, kumquats, mandarin oranges, and grapefruit trees all come in several unique varieties. Some varieties require more care than others. Four Winds Growers is a major dwarf citrus tree producer in the U.S. Their company website is a great resource for dwarf citrus tree care. Look for nurseries that offer extensive information about their varieties, as this will help you care for your tree for years to come. Some varieties of citrus fruits are seedless, others are not. Navel oranges, Midknight Valencia, Bearss Lime, Owari Satsuma, Gold Nugget and Tango Mandarins are the seedless varieties offered by Four Winds Growers. These same varieties, sometimes with different names, are also offered by other producers. There are more seeded varieties than there are seedless. If seeds don't bother you, the number of available offerings increases significantly. 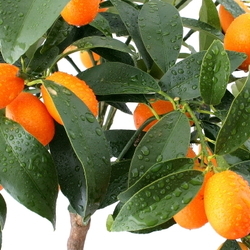 The biggest factor to consider when choosing a dwarf citrus tree is location. Certain varieties grow better out of doors and others perform well in pots. I live in a colder climate, so growing citrus trees outside without a greenhouse is not an option. Instead, I look for varieties growers recommend for potting, although most dwarf citrus trees grow well in containers with a little pruning. I try and keep mine under 6 feet. If you live in a warmer climate but have limited planting space, dwarf citrus trees are the perfect solution. They are also easier to protect when temperatures slip below freezing, due to their convenient size. When planted in the ground, most only grow to 12 feet, although some varieties can reach 15. Most citrus trees bloom in the spring and fruit during the winter, when temperatures are chilly outside. Some trees are especially heat sensitive and require warm temperatures in order to sweeten the fruit. Keeping your tree in a chilly room is not a good option, even if that room gets a lot of sunlight. If you keep your house cool during the winter months to save on heating, you might want to choose a variety that is not heat sensitive. Citrus trees ideally require 9 hours of sunlight each day. If your area receives less than 6 hours of sunlight during the winter months, you will need to supplement your tree with grow lights. This is actually quite simple. Put your grow light on a timer so that it only emits light for a few hours before the sun rises and after it sets. This prevents wasted electricity and allows your tree to make the most of the available daylight. Online growers tend to have a wider selection of products. There are of course risks associated with shipping live plants, but most do an excellent job of packaging their nursery stock for a safe and speedy delivery. It would be wonderful it there was an easy way to find out which dwarf citrus tree works best for us. Unfortunately, like most things, choosing the perfect citrus tree requires a little research. Using these basic guidelines, search nursery websites to see which varieties they offer and which ones fit into your growing lifestyle. Here are a few shortcuts to make the decision process easier. Almost all dwarf citrus trees grow well out of doors and in the ground, provided growing conditions are right. Just remember to prune regularly and offer trellis support in windy areas, as the dwarf rootstock does not offer the same support as a full-size tree. Growing dwarf citrus trees is easier than you think. Use these tips to find which variety works for you, and be sure to let us know your favorites. A Winter Citrus Breakdown Gifts That Keep On Giving: Citrus Trees Backyard Fruit Trees... Think Your Space is Too Small?